Lake Charvak (from Chor bogh, four gardens in Persian) (also transliterated as Tcharvak) Uzbek: Chorvoq is a water reservoir in the northern part of Tashkent Province, Uzbekistan. The reservoir was created by erecting a 168 m (551 ft) high stone dam (Charvak Hydropower Station) on the Chirchiq River, a short distance downstream from the confluence of Pskem, Ko'ksu and Chatkal rivers in the western Tian-Shan mountains, which provide the main volume of water. Currently the confuence cannot be seen and all three rivers discharge directly into Charvak. The reservoir capacity is 2 km3 (0.48 cu mi). 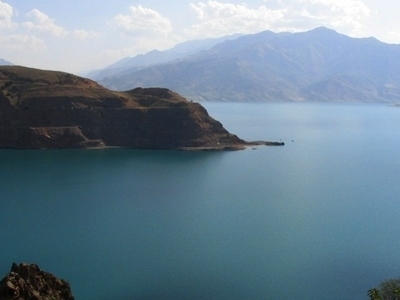 Charvak is popular resort in Tashkent region and thousands of holydaymakers from all over Uzbekistan and neighbouring countries visit the reservoir. Villages on the banks of Charvak such as Yusufhona, Brichmulla, Nanay, Sidjak and their surroundings offer wide range of hotels, dachas, houses and tapchans to accommodate tourists. Yusufhona is also a popular place among paragladers and provides facilities for professionals and newbies in this spot. Here's the our members favorite photos of "Lakes in Uzbekistan". Upload your photo of Charvak Lake! Davron Khusanov is the only Touristlink member to visit Charvak Lake. Have you been here? Click here to save it.